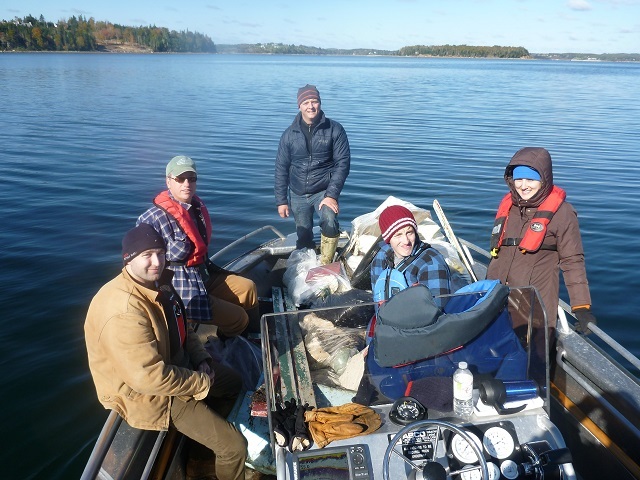 Many thanks to the six volunteers that helped collect 325 pounds of waste from Covey Island. Andrew Robertson (Scott's son), and Miriam Meisner. Many thanks to the six volunteers that helped collect 325 pounds of waste from Covey Island. We had a cold morning start of 2 degrees C when we left the dock at 8:00 am. The frost was on the seats of the open boat and everyone was dressed in winter coats and hats. Upon arriving at the sight of the old wharf on Covey's, the volunteers broke into two teams that worked the shore line in different directions. This allowed us to cover all of the Islands edge and meet in the middle. Our support boat steamed around the island collecting what we found as we went, making our job easier. We are very happy to report that most garbage found was storm wash or older debris. The traditional landing points of Covey's Island revealed a limited amount of new refuse. Earlier in the year we discovered a mess that was left by campers on the main beach area. It delighted us to see that this area was garbage free by the time we arrived on Sunday. Thank you to those stewards that took the time to clean up the camp site, we can all learn a lesson from your efforts! Always remember to pack out what you pack in and please, Leave only your Foot Prints!